Bella Sirena, Sandy Beach - This lovely 2 bed/ 2 bath condo in the beautiful Mediterranean style resort of Bella Sirena is turnkey and priced well below market making it both a great vacation home and investment. 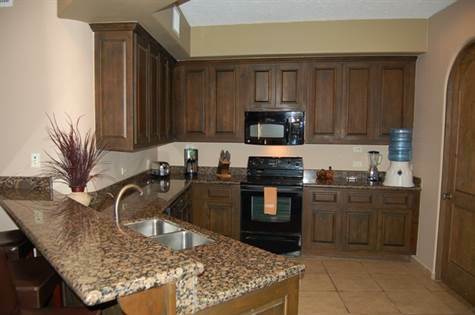 A fully equipped kitchen with upscale appliances and Granite counters. Large laundry room with washer and dryer plus owners lock-off closet. Large living and dining area with beautiful Boveda brick ceiling lead out to a large covered patio with excellent views of the ocean. Huge Master suite with large garden tub and separate shower plus double sinks with surrounding stone features. Fully furnished and nicely decorated all ready for your enjoyment. This development has it all with 24 hour security and a guard gated entrance, swimming pools with swim up bar and 2 spas. Large exercise facility with newer state of the art equipment. The HOA includes CATV and high-speed internet.